Is it possible to create a profitable farm even on a small property . . .? It IS possible to create a sustainable, profitable one acre farm, integrating organic market gardening and livestock production. Done correctly, your garden and your livestock will remain healthy and thriving. At New Terra Farm, we've been market gardening and raising pigs and meat chickens for a number of years. Our livestock animals help prepare our garden area, and clean up garden waste. And our organic CSA market garden, which has fed up to 90 families, is just about one acre! Free download: The One Acre Farm Plan report. This Plan is based on our experiences here at New Terra Farm, and employs the same principles that won us the Premier's Award for our small farm marketing and management model. To get your report immediately, just enter a valid email address in the form below; the report will be e-mailed to you right away, along with more valuable, practical ideas for micro farming for profit . NOTE: make sure you enter an actual address that you can access later, as this is the only way I can send you the report. If you have a small piece of property (or even a big back yard), and would like to create some income from it, WITHOUT damaging it or polluting it in any way, download this free report. We use nothing but sustainable, organic methods in our greenhouse, garden, and livestock production. Demand for fresh, local, healthy foods is growing every year. I believe we are returning to a time when once again small farmers feed communities. And, sad to say, there just aren't enough small, sustainable farms out there! I consider it my mission to help others realize the small farm dream; and to help them understand how to create a successful - i.e. 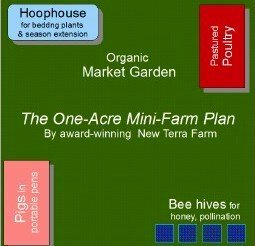 profitable - business , even on a micro farm! Over the past three years, I have helped hundreds of people learn how to create a successful, sustainable market gardening business and raise organic livestock on their small farms. I have shown them how to plan, market, and manage a sustainable mini farm operation. I am happy and proud to say that many of my former farm workers have gone on to start successful farms of their own. If you would like to begin learning the same things, then download my free report, and get started on your own small farm dream.